If you are searching for ways to save the environment, a great place to begin is your regular trip to the grocery store. Start by planning ahead for the week. A meal plan can ensure that you use your food wisely, which will reduce waste and save money. First, take an inventory of your refrigerator, freezer and pantry. Then, make a menu for all the breakfasts, packed lunches, and dinners your family will need this week. Then write out the grocery list of the items you need. Reducing the number of drives to the store is another way to save the environment through meal planning. Once you arrive at the store, one of the best going green ideas is to plot your course strategically to avoid the foods that are over-processed and filled with chemicals and additives. 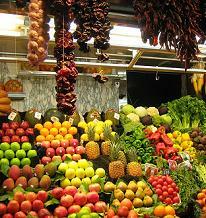 The whole and natural foods are always found around the perimeter of the store. If you start at one side and work your way around the edges of the store, you will find all the produce, dairy, and meat products. One of the ways to save the environment is to purchase these whole foods that have not had additional natural resources spent on their processing. While shopping for these whole foods, you want to choose organic as often as possible to avoid consuming toxic pesticides and hormones. If you’re looking for going green ideas that won’t dramatically increase your grocery bill, you can start by prioritizing organic purchases for the foods that are most likely to be filled with pesticides and hormones. With fruits and vegetables, this means buying organic for the foods where you eat the skin. For example, berries, celery, and grapes would all be good candidates for organic purchases. For dairy, you want to avoid added hormones like rGBH and rbST. Meat doesn’t run the same risk for pesticides as dairy and produce, but hormones are a big concern which is an important reason to consider organic meats. Next, stop at the bulk food aisle for more ways to save the environment. You may be surprised to know that everything from rice and pasta to snacks and cereals can be purchased from the bulk bins. These foods are typically less processed than their alternatives, and have very little packaging which is a good way to reduce unnecessary waste. If you do venture into the center of the store for processed foods, read the labels on the products that you choose. Going green ideas here include aiming for five or less ingredients per product and avoiding products with ingredients you can’t even pronounce. Shopping at the grocery store is something we all do and making proper choices there can be one of the best ways to save the environment. For more going green ideas, visit Going Green Today for a 90-day customized action plan that can help you protect your health, save money, and reduce your impact on the Earth. GoingGreenToday : a collection of writers committed to Green Living and distributing practical green information through articles. Scott Ankeny, founder, created GGT to inspire and teach 1/3 of the United States on how to reduce 1/3 of their Carbon Footprint. Since then he has been joined by dozens of popular authors and Green experts to focus on practical green living solutions.